About Aging Parents: Need to Have a Realistic Discussion About the Consequences of Falling? Need to Have a Realistic Discussion About the Consequences of Falling? Dealing with an elderly parent or other loved one is a challenge to say the least. Sometimes it seems like you're dealing with a toddler or small child with an old soul. They want to do things they can no longer safely do and they can get cantankerous and downright obstinate. It's like dealing with a teenager who thinks he is invincible. They want to remain independent and are argumentative about almost everything! It can be most frustrating to deal with. Safety is one huge issue as balance and gait changes begin to set in with the normal aging process. Chronic diseases such as arthritis, and Parkinson's can complicate the situation because they severely limit joint mobility and cause the gait to shuffle and scissor almost uncontrollably. Dizziness and vertigo play havoc when trying to ambulate and not feel like you're drunk or impaired. A fear of falling can cause a person to tense and to make sudden sharp movements as they gain seconds of confidence. Ask your loved one if s/he is afraid of falling and the answer is likely YES! Yet where is that assistive device? The walker is probably back in the bedroom. The cane is next to the door so s/he might remember to take it if s/he ventures outside. And the lifeline device? Oh it's hanging on the lampshade or a doorknob. 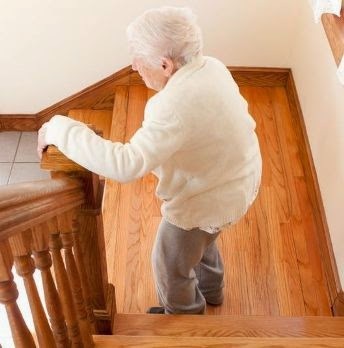 Falling is the leading cause of death due to injury among seniors. This is due to complications such as head injury, fractures and immobility related pneumonia. Sometimes if your loved one falls and can't get up it could be considerable time before anyone discovers they are down. This can lead to all sorts of complications such as muscle breakdown that begin in 30-60 minutes, dehydration and hypothermia which can be life threatening or even fatal. So how do you get this proud, determined, elderly person to actually USE their assistive device and keep that lifeline around their neck?!! By age 80, 50% of seniors will fall at least once a year. One fall can be too many. Once a person falls they are more likely to fall again. Sometimes you have to use the same type of reality scare tactics they used on you when you were that invincible young person. It's also important to remember your job is not to become the parent although it seems like that's what is happening. This makes your job incredibly more difficult and challenging! These elderly loved ones, no matter how childlike they become, are still our parents, aunts, uncles, grand parents and friends. We need to be respectful while guiding them in the direction of making safe and sane decisions on their own if they are capable of doing so. Alzheimer's and other dementia can take this option off the table quickly. But as long as your elder is capable of making decisions, try to have a hypothetical or logical and harshly realistic discussion about what they would want done in case they were injured in a fall. Do they really want to do something to jeopardize their current lifestyle? A typical fall for an elderly person doesn't just result in a skinned knee or bruises. All too often these falls result in broken bones (hips, wrists, shoulders), major skin tears requiring sutures, or head injury. Would they want surgery to repair a broken hip, wrist, or other joint? Or would they prefer to spend weeks in bed hoping for the fracture to heal so they could eventually be pivoted to a chair or commode for a few hours each day? Would they want to be intubated if they ended up with a very bad case of pneumonia and couldn't breathe? What if they hit their head and ended up with a brain injury? Would they want to have a feeding tube inserted and possibly need to be sustained on life support devices? How would they feel about a long rehabilitation process? With a broken wrist for instance they will probably find themselves in need of assistance to dress, bathe, eat and even wipe their own bottom for several weeks! Who would they like to have helping them? In the course of this conversation, you'll hopefully plant the seed to help them take stock in their own safety and actually use the devices, but you'll also gain some insight into their feelings about general end-of-life desires. It might just open the door to having that conversation soon too. What Would Help Make the Device More Effective? Meanwhile, help them to decide which devices they will use. Perhaps a cane needs some sprucing up or decoration to fit their lighthearted personality. Or the walker needs to be outfitted with a basket or tray so they can carry their clothes to the bathroom or bring their coffee cup and cereal bowl to the easy chair. The device may not feel like it's the right height or doesn't give them the same feeling of stability that hugging the walls or furniture does. Perhaps it's too heavy, or feels flimsy. Maybe they need something different. Sometimes there's a completely logical explanation for leaving the device behind.And sometimes it's just a change they need to vent about and begin to accept. Be gentle, be kind and be supportive. Change is NEVER easy. And growing old is not fun! But this is for their own good, and your piece of mind. Ahh you are giving them back all the same reasons they gave you growing up for worrying about your safety. Life is a circle and someday you'll be having these conversations with your adult children over your care and safety. Start making plans to decorate your cane now!